Diana Krecsy (left) and Alina Turner speak about the report they co-wrote at a news conference on Jan. 8, 2019. Despite a “dizzying array of social services” available in Calgary and other cities across the country, people who need help often don’t know where or how to access those supports, a new report from the School of Public Policy indicates. Written by School of Public Policy fellow Alina Turner and Diana Krecsy, the president and CEO of the Calgary Homeless Foundation, the study states that $33.5 billion is spent in Canada each year on 167,000 fragmented services delivered by government and non-profit organizations for homelessness and related issues, including 20,000 social and community services in Alberta. “There must be a better, more cost-effective way to achieve results through co-ordinating this confusing jumble of services,” the report summary reads. Turner said despite how much has been invested and how many services are available, people still report that they don’t know where to go to get help or how to access that help. 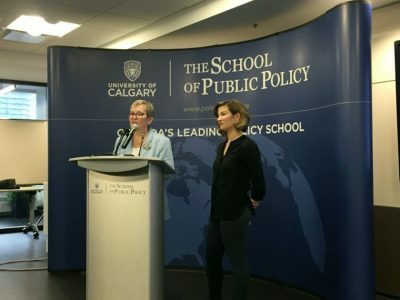 “I have a PhD in these issues and I still don’t understand how these services work and how they relate to each other and how I can direct someone to effectively access them,” Turner said at a news conference at the University of Calgary’s downtown campus Tuesday. Even more concerning, she added, is there is no “line of sight” across all of the services to understand their effect, and to know which services should be enhanced and which should be repurposed or consolidated to get better value out of the investments. “We’re not doing enough at the top levels of decision-makers to co-ordinate these systems together to ensure that there’s a bottom-up and a top-down integration effort,” she said. Krecsy said the foundation learned during work on Calgary’s 10-year plan to end homelessness that there are great successes and “great talents” in agencies across systems — but that there are also gaps. Locally, an effort called the Community Systems Integration Table is bringing decision-makers together to look at priorities and strategies. She said while there has been “phenomenal work” by front-line agencies and not-for-profits, prevention of homelessness needs to begin in the public systems, such as health. “We need to . . . figure out how we can do services in a different way that prevent people from getting into homelessness in the first place,” she said. The report states that integrating services should not result in more layers of bureaucracy, and that the focus should remain on the clients who use the services, not on the systems involved. Ultimately, the co-authors say, integration of services will not be about cutting back on funding, but using existing funding more strategically and transparently.